This year’s Chancellor’s Academic Scholarship recipients Ja’Vonya Trotter, Adonis Hyman, and Kendell Brown will receive a fully funded, four-year scholarship. 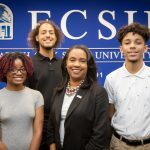 They were congratulated by ECSU Interim Chancellor Karrie Dixon. 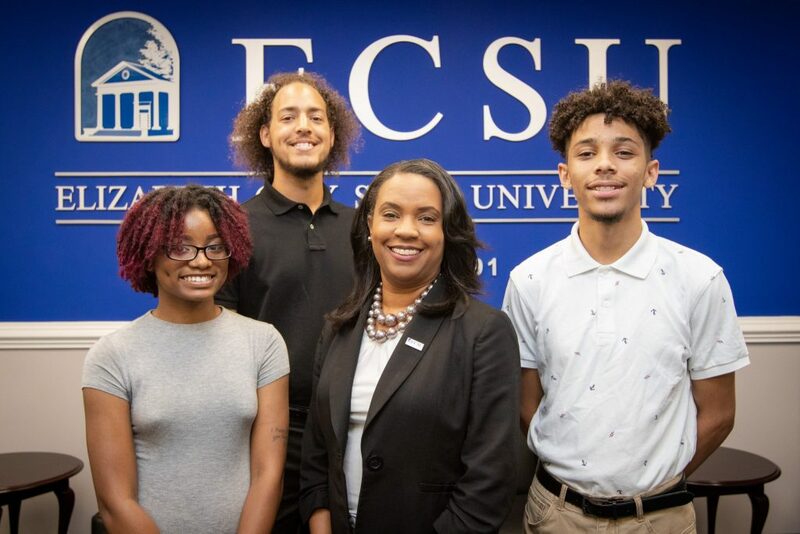 Three Elizabeth City State University freshmen have been awarded Chancellor’s Academic Scholarship. These students have been awarded a fully funded, four-year scholarship that covers the cost of full tuition, student fees, university house, meals, and textbooks. Virginia residents Kendall Brown, Adonis Hyman , and Ja’Vonya Trotter are the 2018 scholarship recipients. These students are all members of the ECSU Honors Program. Kendall Brown, a business administration major, is from Norfolk, Virginia and a graduate of Norview High School. Brown comes to ECSU with a GPA of 3.5067 and an SAT score of 1280. Adonis Hyman, who has not declared his major, comes from Chesapeake, Virginia and is a graduate of Oscar F. Smith High School. Hyman comes to ECSU with a 4.28 GPA and a 1310 SAT score. Ja’Vonya Trotter, a biology major, comes from Portsmouth, Virginia and is a graduate of I.C. Norcom High School. Trotter comes to ECSU with a 3.44 GPA and a 1280 SAT score. The Chancellor’s Academic Scholarship was established as a merit scholarship program for incoming freshmen attending ECSU. The purpose of the scholarship is to provide an outstanding educational experience for students who are exceptional scholars, versatile, and well-rounded individuals. Scholarship recipients are expected to maintain a 3.5 cumulative GPA annually; enroll full time each semester and earn a minimum of 30 credit hours each academic year; maintain membership and active participation in the ECSU Honors Program. Applicants for this scholarship are expected to have a minimum 3.5 or higher unweighted cumulative GPA; a minimum SAT score of 1260, or ACT score of 26. They are also expected to demonstrate a commitment to academics, service, and be involved in extracurricular activities. For more information about the Chancellor’s Academic Scholarship, visit www.ecsu.edu and go to Financial Aid.